I was contacted yesterday by Peter DeBiase, a new reader of this blog and a member of the Notebook Review forums. Peter linked me to this thread where European purchasers of the Lenovo Thinkpad Yoga are complaining about a defect in the digitizer that they've come to call "the Black Hole." The problem was first reported by simon_at_mso, who documented the issue with the image below. (It's never occurred to me to use a straight edge on top of a tablet, but I may adopt this technique for future testing). The pinching visible toward the upper right corner has been verified by several other users. "The funny thing is, if you check out the online ThinkPad Yoga Service Manual and head to FRU Videos > FRU Service: LCD Panel, you can see that there don't appear to be any components behind the affected area in the upper right quadrant of the screen. This indicates to me that the problem must be internal to the LCD panel - either an unshielded component within it causing an errant EM field, or perhaps a defective digitizer layer." We have been investigating this and so far it looks like this is an issue related to the firmware level on some of the digitizers in systems built prior to mid November. Manufacturing has already been updated and new production units are not be affected. I think we will have more information shortly. I am hopeful that we will be able to provide a downloadable firmware update as we have with some other systems like helix, twist, and carbon touch to provide fixes and improvements to the digitizer. So hopefully this software fix will correct this otherwise major flaw. The machine I had been counting on reviewing next week has now been delayed until December 8, which means I won't have it before mid-December. You can rest assured that the Black Hole will be the first thing I investigate. UPDATE November 20: The Thinkpad Yoga is now available for sale on the US store. Shipping is estimated for Nov. 28. The Thinkpad stylus is siloed in the front right corner of the device. A Core i7 8/256GB convertible will set you back $1739. The base model is a Core i5 4/128GB for $1299. Both include pen support, although it's not clear whether the pen is included. I don't think so, but the pen is also not available to order as an accessory as part of the order. I also double checked the Microsoft Store and they are still listing an i5/8/256 configuration for $1399 available Dec. 25. The Lenovo Thinkpad Yoga in tablet mode, with pen. Both models currently sold in the US include the Wacom digitizer. 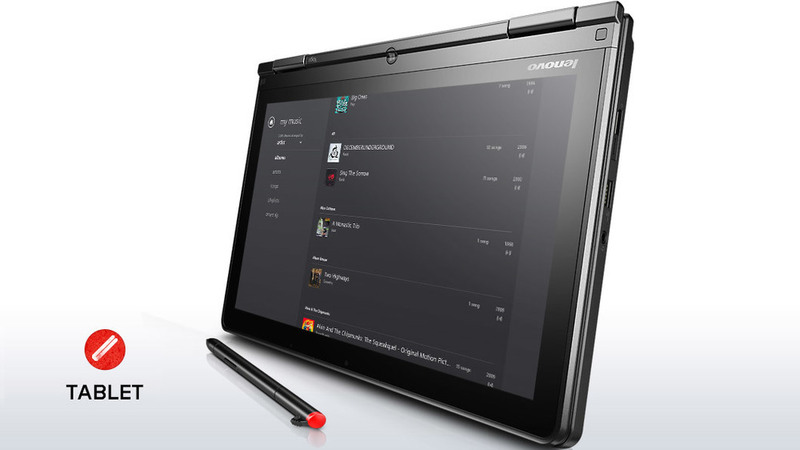 UPDATE 3 November 19: The Thinkpad Yoga is now available for pre-order from Lenovo's UK site. The store lists two non-digitizer models and two penabled ones. The latter are approximately £200 more than the capacitive touch versions. This is different than the information I'd received from Lenovo customer support here who told me that all Thinkpad Yoga models would be digitizer-equipped and only the pen would be sold separately. Pricing is also significantly higher than expected. The higher end Core i5 8/256 model is listed at £1260 or approximately $2030. That's far too much for a keyboard and two inches of additional screen real estate vs. the Surface Pro 2. Hopefully the U.S. price will be significantly lower. UPDATE 2 November 6: Still no official updates from Lenovo, but the Microsoft Store now shows the product's release date as December 25. So it appears the release date has slipped by at least one month. That's a real shame for anyone who was hoping to find one of these in their Christmas stockings. UPDATE October 29: The Thinkpad Yoga is now available for pre-order from the Microsoft Store for $1399. This is for an Intel Core i7-4500U 3.00 GHz, 8 GB of RAM, 256 GB storage, and 12.5 in Full HD IPS (1920 x 1080). It's not clear from the specs but we believe that the Wacom pen is standard in this model. So for about the same price as the Surface Pro 2 plus keyboard, you get a larger screen and faster processor in a heavier form factor (3.96 lbs. vs. 2.55 lbs with type cover). Sold? One concern I didn't think about while first writing about the convertible laptop category is what to do for keyboard input while in tablet mode. Though it's very awkward, artists may need to carry around a mini-bluetooth keyboard for access to those all-important hotkeys. Does that defeat the purpose or is that a small price to pay for the additional couple inches of screen real estate? Every tech blog is brimming with new product announcements this week, but they sure have a way of burying the lead. When it comes to artists and designers, the first question we all want to know is: does it have an active digitizer? A year after Windows 8's release, it's dismaying to see so few penabled tablets and convertibles available. And every product that does include a stylus seems to include other crippling compromises. Thanks to Tom Warren, Sr. Editor at the Verge, I spotted the Thinkpad Yoga and its optional Wacom digitizer buried deep in the middle of the press release below. Scheduled to be available in November, with a 12.5-inch screen, 1080P display, Haswell Core i7 processors and up to 1GB of storage, the Thinkpad Yoga may end up on many artists' Christmas lists, especially at its $949 starting price. 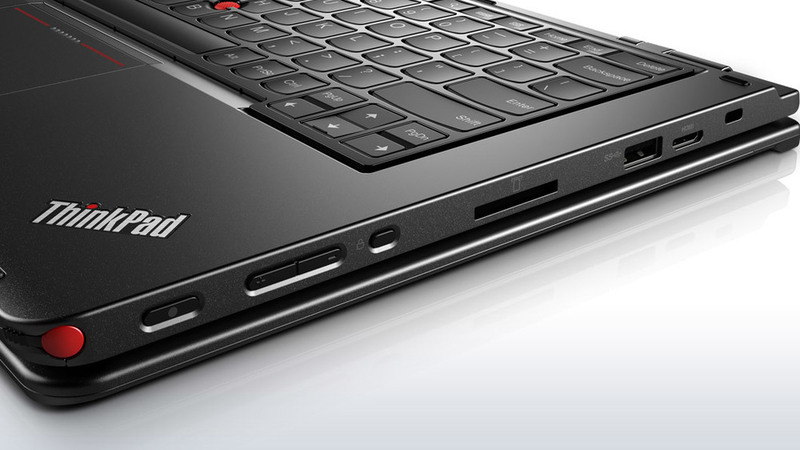 The Thinkpad Yoga also debuts a new design innovation: keys that recede in tablet mode. See the video below for a brief glimpse of that new feature. I'll need to see how the back of the device feels as I cradle it in tablet mode, but the Yoga may end up as my Surface Pro replacement. BERLIN, GERMANY – September 5, 2013: Lenovo(HKSE: 992) (ADR: LNVGY), creator of multimode computing, today announced at the 2013 IFA consumer electronics show in Berlin, a broad expansion to its portfolio of multimode devices. The new lineup starts with two new Yoga convertibles: the Yoga 2 Pro, successor to the original 360° flip and fold 13.3-inch Yoga, and the new ThinkPad Yoga, built to take business users to new heights with its multimode design and business-heavy features. Additionally, Lenovo is bringing multimode computing to mainstream laptops and desktops with the new dual mode Lenovo Flex 14 and 15-inch laptops and Flex 20 all-in-one (AIO) desktop. These machines give consumers all the productivity of a PC plus one extra mode, essentially giving them two powerful devices at one affordable price. Users will instantly notice the Yoga 2 Pro’s impressive, eye-popping 13.3-inch display: Its QHD+ super high resolution 10-finger touchscreen displays images in 3200X1800 resolution in a 16:9 aspect ratio, equivalent to four times the visual clarity of the original Yoga’s HD+ (1600X900) screen and the highest screen resolution on the market today. The 350-nit screen features IPS 178° wide angle viewing for great views from nearly any line of sight. Unbelievably thinner and lighter than before at 15.5 mm thin and 1.39 kg, the extra mobile Yoga 2 Pro lets users easily enjoying computing in each of its four modes: laptop, tablet, stand and tent. Yoga 2 Pro also features advanced technologies including choices of up to Intel 4th generation Core i7 ULT processors, Windows 8.1, up to 512 GB SSD, Intel WiDi for streaming content wirelessly to a TV, Dolby Home Theatre v4 and up to nine hours of battery life1. It also features a new backlit keyboard and comes in its signature Grey or Clementine Orange color. The recently introduced Yoga 11S will also be adding choices of up to 4th generation Intel Core i7 processors. A full-function laptop and tablet, Yoga 2 Pro infuses new smart features including Yoga Picks, a concierge-like tool that suggests suitable apps based upon the device’s mode, custom apps and voice control. For example, in tablet mode, Yoga Picks suggests apps like Birizzle, a popular touch game, and Zinio, an e-reader. In tent mode, it offers the painting app, Fresh Paint and Rara music streaming. Additionally, Yoga 2 Pro comes with apps created especially for its four modes. In laptop mode, Phone Companion lets users copy content from documents or websites/pages and send the information to their phones as a text message. Yoga Photo Touch allows users in tablet mode to edit or retouch photos using their fingers on the 10-point multitouch screen. Built for stand mode, Yoga Camera Man lets users take photos with effects like lomo, 4-in-1, macro, GIF and more to photos, and Yoga Chef in tent mode taps into Yoga 2 Pro’s motion control and voice control to advance recipes from cooking apps. Also available for Yoga 2 Pro is the N700 multimode wireless mouse, sold separately, that rotates 180° to double as a pointer so users can switch between desktop work and presentations. While borrowing Yoga’s flip and fold, four mode design, the ThinkPad Yoga creates its own space for business customers with its performance, security and productivity features as well as customization options. The 12.5-inch magnesium alloy ThinkPad Yoga offers a stunning visual and intensive multimedia experience starting with choices of a Corning Gorilla Glass HD IPS or a FHD IPS display (optional digitizer and pen available for the FHD display) running Windows 8.1. For a responsive touch experience, use its 10-finger touch screen running Windows 8.1 or its oversized five-button glass trackpad optimized for gestures. Designed for maximum comfort in all modes, the ThinkPad Yoga features a unique lift and lock system created for tablet mode. The system automatically lifts and locks the keys on the machine’s keyboard in place for a streamlined feel. Additionally, ThinkPad Yoga features the legendary ThinkPad keyboard with optional backlit models and models with Near Field Communications (NFC) to easily share data between devices. The ThinkPad Yoga has the key performance technologies business users need: choices of up to Intel 4th generation Core i7 processors, up to 1 TB of storage equivalent to the size of storing 500 DVD movies as well as all-day battery life. The ThinkPad Yoga also responds to voice input so users can chat on Instant Messaging programs, play their music, search the web and more without lifting a finger. And for an expanded workspace, Lenovo’s One Link dock, purchased separately, provides USB ports, a mini-HDMI connection, Gigabit Ethernet and more. More than a thin and light laptop, the dual-mode Flex 14.1-inch and 15.6-inch laptops creatively flip 300° for stand mode, a new way to interact with a PC and positions the device closer to the user for more natural, comfortable touch experience. Users can open Lenovo’s custom YouCam program, say “1,2,3 cheese” to snap a webcam photo and then send it to a friend using Flex’s voice commands1. Or they can enjoy cinematic quality sound to the latest NetFlix movie with Flex’s Dolby Advanced Audio v2 without a keyboard in the way or even watch high definition content on another screen via Flex’s HDMI-out connection. Beyond Flex’s extra value with its dual mode, flip functionality, its fashionable soft-touch black cover trimmed with silver or Clementine Orange also attracts attention. Equally stunning, the interior contains a clean keyboard design with optional backlighting.2 Images are vividly rich thanks to Flex’s HD 1366X768 or optional Full HD 1920X1080 displays.2 With 10-point multitouch, Flex makes using Windows 8 and collaboration easy. With up to nine hours1, Flex 14 and 15 are extremely mobile and are primed for productivity with up to Intel 4th generation Core ULT i7 processors, up to Nvidia discrete GT 740M graphics3, up to 1 TB of storage and optional SSD or NAND flash on Ultrabook models. Framed in an attractive 20.5mm thin aluminum shell, the compact Flex 20 fits neatly into virtually any home or office yet surpasses expectations for an everyday AIO with its grand 19.5-inch frameless HD (1600X900) IPS 90° tilt display, 500 GB HD or SSHD storage and up to Intel Core i7 processors. However, Flex 20 really surprises and delights with its special ability to convert from stand to table mode. When flat in table mode, the Aura interface, first pioneered on the Lenovo Horizon Table PC, opens for a multi-game, multi-player experience like no other. In this mode, users can challenge others to play games, including preloaded ones like Ubisoft’s Raiding Company, those available for purchase from the Lenovo App Store powered by Intel App Up and newly created custom Lenovo games including Omnitapps Media Puzzle Pack for making fun video puzzles and Omnitapps Educational Suite with a series of memory and learning games along with other Lenovo games like Fishing Joy, Air Hockey and Roulette. The dual mode Flex 20 provides even more entertainment value with its special physical accessories (sold separately) - joysticks, strikers and e-dice – that allow up to four players to interact directly with the digital games, or players can use the 10-point multitouch screen. The Aura interface functions as a highly collaborative tool for multi-media content enhanced with its Dolby Home Theatre v4 audio. Unlike most AIO’s, Flex 20 has mobility in mind with built-in WiFi for easy moving around the home or office, and users can pick up and go for up to three hours without charging. Lenovo Services offers a host of integrated solutions to meet the needs of business customers and consumers who purchase a Lenovo convertible device, including warranty extensions/upgrades, accidental damage protection, keep your drive, priority tech support and a set of factory and automated deployment services. MSRP for the Lenovo Yoga 2 Pro, ThinkPad Yoga, Flex 14/15 and Flex 20 AIO is $1,099.99, $949, $629.99 and $899.99, respectively. The Yoga 2 Pro will be available beginning in October while the Flex products will be available starting in late September. The ThinkPad Yoga will be available beginning in November. The N700 multimode wireless mouse will be available beginning in September at $59.99. 1YouCam and voice control available only on Ultrabook configurations for Flex. Up to nine hours of battery life on Ultrabook Flex configurations. Nine hours on Flex and Yoga 2 Pro achieved with Windows 8 idle at 150 nits or six hours of battery life for video playback at 150 nits.